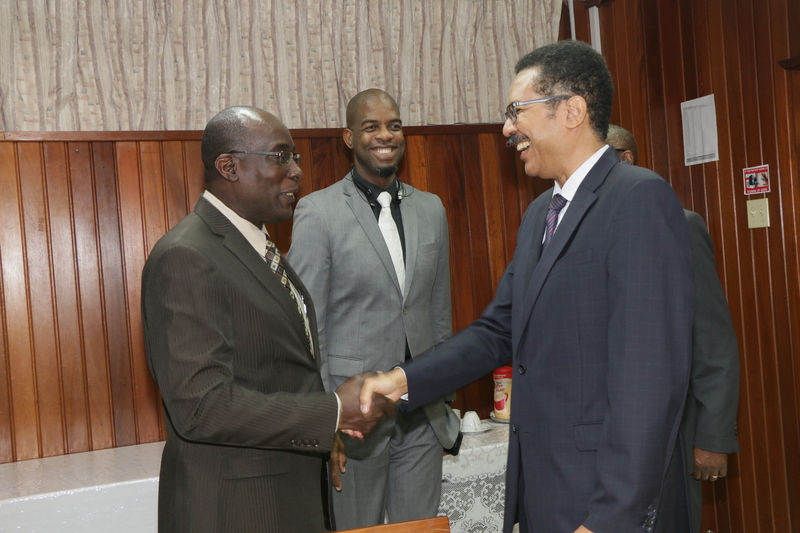 UTech, Jamaica Welcomes Professor Stephen Vasciannie as President — UTech, Ja. Prof. Stephen Vasciannie, CD (left), newly appointed President of the University of Technology, Jamaica (UTech, Ja.) is welcomed by Prof. Colin Gyles (2nd right), Deputy President on his arrival at the Papine campus on Monday, January 3, 2017. Sharing in the occasion are from left, are UTech, Jamaica Council Members, Hon. Shirley Tyndale, OJ, Mr. Aldrick McNab, Mrs. Sharon Hay-Webster (partially hidden) and Mr. David Drysdale, University Librarian. Professor Stephen Vasciannie took up office as the new President of the University of Technology, Jamaica (UTech, Ja.) on Tuesday, January 2, 2017. 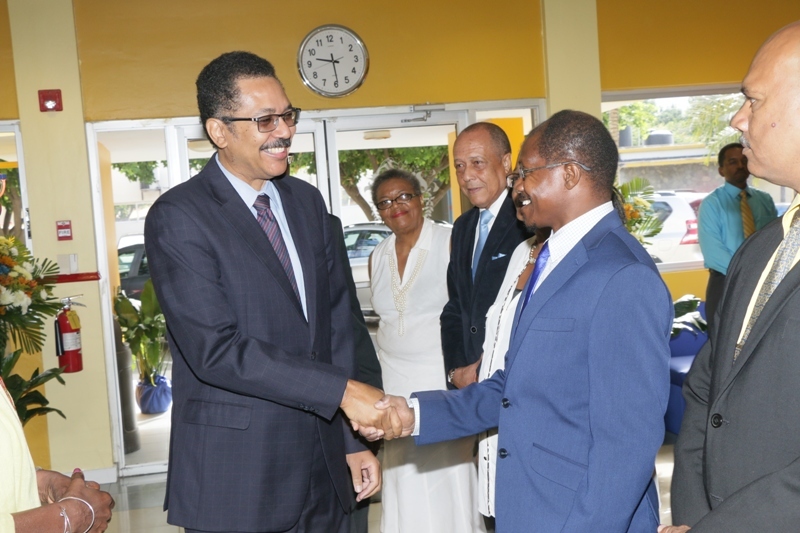 On his arrival on Wednesday, January 3, 2017, Mr. McAnnuf-Jones, Deputy Chairman, UTech, Jamaica Council and Dr. Elaine Wallace, University Registrar presented Prof. Vasciannie to Members of Council, University Officers, Vice Presidents, Associate Vice Presidents, and other members of Executive Management and staff during a special welcome ceremony hosted at the Papine campus. Following his arrival, Prof. Vasciannie has been participating in a series of on boarding orientation activities to introduce him to the institution’s internal and external stakeholders. These activities include meetings with the University’s Chancellor, Executive Management, the Students’ Union, Heads of Unions and the Minister of Education, Youth and Information. MEETING WITH EXECUTIVE MANAGEMENT: Prof. Vasciannie meets with members of the Executive Management Team on Tuesday, January 3, 2017. WELCOME ON BOARD: Senator the Hon. Ruel Reid, CD (left), Minister of Education, Youth and Information and Prof. Stephen Vasciannie, CD, President, University of Technology, Jamaica (UTech, Ja.) share a hearty laugh during a courtesy call on the Minister at the Ministry of Education on Thursday, January 5, 2017. COURTESY CALL ON CHANCELLOR: The Most Hon. 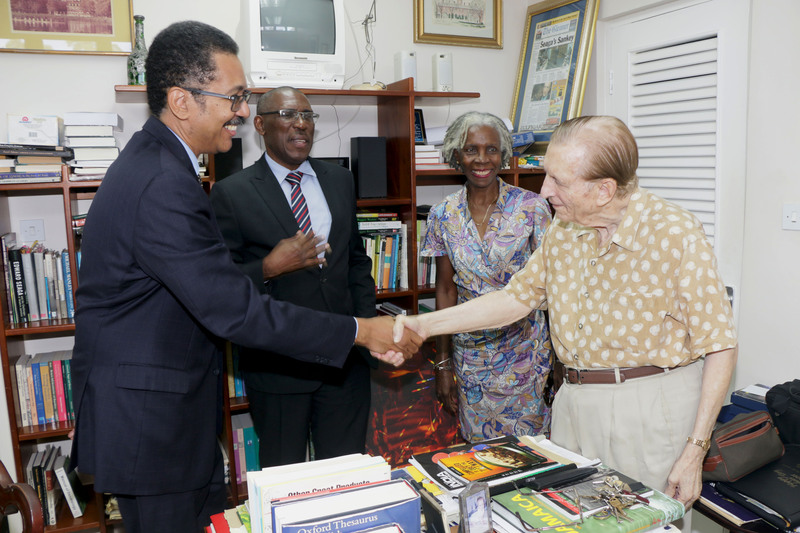 Edward Seaga, ON, PC (right) Chancellor, University of Technology, Jamaica (UTech, Ja.) welcomes Prof. Stephen Vasciannie, CD, President, University of Technology, Jamaica (UTech, Ja.) during a courtesy call on him on Friday, January 6, 2017 at Mr. Seaga’s Distinguished Fellow Offices at UWI, Mona. Prof. Vasciannie was accompanied by Michael McAnuff-Jones, Deputy Chairman of Council and Dr Elaine Wallace, University Registrar.